Divers from around the world set out to dive the cool, emerald waters of the Pacific Northwest to witness shipwrecks that few have ever laid eyes on, and to photograph marine life that is truly unique to this part of the world. Nowhere else can a diver find a Giant Pacific Octopus or Wolf Eel year-round, with as much regularity as the divers commonly do in Puget Sound and off the coast of British Columbia. Winter brings about frequent encounters with Harbor Seals who are as playful as they are curious about the bubble-making visitors. Though extremely rare, Sixgill Shark sightings are a possibility, and many longtime divers in the area have had close encounters with this prehistoric shark. Wrecks, like the SS Governor beckon and challenge even the most well-trained technical divers. And, a small army of devoted, enthusiastic divers make for a vast network of local resources as well as provide a sound foundation for a rich community of people who share a common passion for underwater exploration and photography. Flanked on one side by the nutrient-rich Pacific Ocean, the City of Seattle also has generous freshwater shoreline bordering Lake Washington, a large body of water that is filled with well-preserved wrecks. Vancouver, recently home to the 2010 Winter Olympics, also boasts a number of fantastic dive destinations within a short drive or ferry ride from its cosmopolitan core. The visitor to either region is treated to a similar, expansive topside experience: stunning metropolitan areas surrounded by snow-capped peaks, evergreen coniferous forests, adjacent to placid freshwater lakes and surrounded by the ocean. The fascinating structure that allows for the high level of biological diversity offered by the Pacific Northwest Region is due to its geological history. Puget Sound, the body of water surrounding Seattle and the adjacent area, is an estuarine system in the state of Washington that stretches approximately 100 miles in length. Carved out during the ice age, this complex system of waterways is affected by a large tidal exchange (~15′) which results in strong currents that are then able to distribute rich nutrients to support a large and diverse aquatic food chain. Also, the diffuse estuaries of Puget Sound allow for the development of a multitude of healthy, protected reefs, which have been able to develop outside of the influence of the pounding surf that batters the coastal shoreline. In Canada, pristine reef systems and large, pelagic animals remain healthy and protected, due to the relatively sparse population distribution on places like Vancouver Island, famed for its Cloud Sponges, fields of Strawberry Anemones and cold water Gorgonian Corals – as well as its large marine mammals like the Orca, Sea Lion, Grey and Humpback Whales (these are typically seen from aboard boats). Dive travel to either Washington State or British Columbia typically begins with a landing at Seattle-Tacoma International Airport (SEA) or Vancouver International Airport (YVR), respectively. Travelers heading to Vancouver Island will have to take a ferry to either Horseshoe Bay (Nanaimo) or Schwartz Bay (Victoria). Divers wishing to explore the San Juan Islands of Washington State will drive North from Seattle to board dive charters, whose boats moor about a two hour drive from Sea-Tac airport. There are many shore dives in the region, as well as resources for proper planning of those dives (see below). Alternatively, it’s always nice to have a full service experience on one of the many great charter operations in the area, that cater to the needs of the cold water diver. The unique combination of nutrient rich water, fast currents and lack of surf allow for a multitude of large species to live in the emerald waters of Puget Sound. The most well known of these being the Giant Pacific Octopus, Wolf Eel (which is actually a fish – not an eel), Sea Lion, Giant Egg Yolk Jellyfish, Harbor Seal and Sixgill shark. Also, if you’re (un)lucky, you might even encounter a pod of Orca. Both a photographer’s dream and his/her greatest challenge, Puget Sound provides a chance to photograph some of the biggest and most stunning animals in the underwater world. Don’t leave your macro lens at home though, there are many smaller, or even tiny sea creatures that are fantastic-if-unusual subjects, from a world that is far removed from the sunny, colorful tropical reefs to the South. Some photogenic examples of smaller creatures are the Stubby Squid, Hooded Nudibranch, Mosshead Warbonnet, Spiny Lumpsucker, Red-gilled Nudibranch and Grunt Sculpin. All of these critters (and more) are commonly found while diving in the Pacific Northwest. There is a tremendous amount of biological diversity in our emerald waters – so a photographer’s portfolio is only limited to the number of dives s/he can get in, as well as their preparation and skills at shooting in green water. Water temperatures fluctuate during the year between about 45-55 degrees Fahrenheit. Visibility can range from an average of about 15′ to 80-100′ during optimal conditions. Remember though, all of that particulate matter making the water murky is akin to the grass at the bottom of the terrestrial food chain. Crystal clear water is gorgeous, but it’s also relatively devoid of nutrients. Algae and plankton blooms happen throughout the year, and though I oftentimes hear the rule of thumb that the water is clearer during the Winter, I find many exceptions to that rule. So, plan your trip to the Pacific Northwest sometime between late Spring and early Fall – so that you can soak up the many topside pleasantries and attractions during your visit; there’s no reason to slog it to a dive site in mid-February hoping for clearer water only to find that all the rain and runoff has spoiled your best photographic opportunities. The first thing you’ll have to understand about diving in the Pacific Northwest is that there’s a lot more equipment to contend with than is the case in warmer waters. The most fundamental difference is the exposure suit. Whether diving in a wet or drysuit, you should be sure to find one that fits you appropriately, as having a suit on that doesn’t fit properly will affect the way that the rest of your kit will work together. 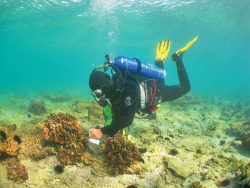 Divers should also consider taking an orientation course or linking up with a qualified local dive guide, given that the limited visibility and cold water temperatures make skills like underwater navigation and buoyancy control much more challenging than is the case in other diving destinations. An underwater compass and powerful dive light are essential items to have in the cold water dive kit. Additionally, fins that are well suited for warm water will likely not provide sufficient thrust when the diver is encumbered with more equipment and thus subject to more underwater drag. Lastly, the great tidal exchange in Northern latitudes necessitates consulting tide tables to plan dive times around. While some sites commonly used for training beginner-intermediate divers are not current intensive, most sites – including those done from boats, are very current intensive. Thus, the visiting diver should seek out an experienced local guide or dive buddy, when making dive plans. Never shot in green waters before? The biggest differences between shooting underwater photography in the waters of the Pacific Northwest versus most tropical destinations is that the water has a lot more suspended particulate matter and a lot less natural light. Once you descend down past about 100fsw, any dive becomes a night dive. So, you’ll need to bring an adequate amount of lighting with you, making sure that you have diffusers for your strobe(s) to avoid lighting up all of that suspended particulate matter. Proper buoyancy technique is tremendously important, as most of the critters tend to hide underneath seaweed, rocks or buried in the silty bottom. Photographers should plan to spend more time getting positioned correctly, given the thicker exposure suits (and undergarments). Thus, it becomes important to snap multiple shots of your subject, so that you don’t have to re-compose similar shots at a different time. Natural light is very difficult to capture in green water with a resulting aesthetic appeal. Most underwater photographers in the area experiment often with different amounts of water between and behind the subject, shooting up near a 45-degree angle to catch the natural light cascading down behind the subject, which is illuminated by the internal flash or external strobe. Auto-focus becomes difficult to use in the dim lighting conditions and with the increased amount of particulate matter in the water. So, many photographers use a light to focus the camera on the subject before taking the shot. You can use a standard dive light as a focus light. Or, if you want both hands free to work with the camera there are a number of camera-mounted focus lights on the market. I prefer the Fisheye FIX 500DX LED Focus Light for its lumen output, battery life and durability, but there are several alternatives on the market. If using an external strobe, move the strobe(s) as far out as they’ll go and consider aiming them slightly further away from your subject than you normally would in clear water, using just the edges of your strobe’s output. This generally helps to reduce backscatter. When shooting macro photography, be very mindful while resting on the bottom, as a single fin kick or hand movement used to reposition yourself can result in silting out the area around the subject. Jacques Cousteau famously referred to Puget Sound and the waters off of British Columbia as one of his favorite places to SCUBA dive in the world (second only to the Red Sea, stated in his opinion). Laden with shipwrecks steeped in history, granite boulder fields providing hidden dens to giant octopodes and snaggle-toothed wolf eels, and forests of colorful plumose anemones – many divers find the emerald waters of the Pacific Northwest to offer an exciting, challenging dive destination – as opposed to the relaxing, pleasant experiences typically conjured by thoughts of tropical locations. The region is home to one of the largest markets for dive equipment in the United States, with many manufacturers of SCUBA equipment headquartered here. Being subject to such challenging conditions, diving in green water is not for the faint of heart nor the folks with one foot in. The result is a strong sense of devotion, camaraderie, interdependence and community – with a bit of technical gear-lust addiction thrown in. Lastly, some of the best, most well-respected dive instructors are located in the Pacific Northwest, and people from all over the world come here to train with them. Lastly, one of the most intriguing things about diving and shooting underwater photography in the Pacific Northwest is that the creatures and settings are from a completely different color palette than is found in most dive destinations around the world. Rich, dark purples, vermillion reds, scaly greens and vibrant orange colors embed themselves in a lot of rocky, sandy earth tones. Many divers are as shocked by the brilliant, unusual colors as they are stunned by the unfamiliar shapes and sizes of creatures. The lighting conditions make it so that this is something that is difficult to share (from an imaging standpoint), but also enormously gratifying to experience. Diving in Washington State can generally be subdivided into three regions, Seattle metro, Olympic Peninsula and the San Juan Islands. Seattle & Surrounding Metro area – From Mukilteo down to Tacoma, you’ll find many great dive sites in proximity to urban areas with plenty of places to stay, eat and have fun topside. There are many dive shops to make use of and some of my favorites are Northwest Sports Divers, A-2-Z SCUBA and Tacoma SCUBA.My favorite shore dive sites are Sunrise Beach (advanced) – where Wolf Eels and Giant Pacific Octopodes can commonly be seen, Alki Junkyard (intermediate) – a lesser known site with many small critters and invertebrates, Cove 2 (beginner – intermediate) – one of the most scenic and convenient dive sites around, Edmonds Underwater Park (beginner – intermediate) – this site offers a vast network of artificial reef structure and home to many gigantic fish. Consider using Bandito Dive Charters for boat diving in the South Sound. Olympic Peninsula – Hood Canal is a long stretch of water that is home to many great dive sites, most of them accessed by boat, including The Pinnacle, Pulali Point, Black Point, Rosie’s Ravine, Sund Rock (shore dive) and Octopus Hole (shore dive). Get in touch with Pacific Adventure dive charters for boat diving, or Hood Sport ‘n Dive or Mike’s Beach Resort for shore diving in the Hood Canal area.Other popular dive sites on the Olympic Peninsula include Point Hudson, Olson’s Jetty and Salt Creek. For technical divers, consider researching the wreck of the Diamond Knot or the SS Governor or diving in Lake Crescent.Topside, visitors should check out the Olympic National Park. San Juan Islands – This is specifically the region of Puget Sound that Cousteau referenced after his visit to the area. Picturesque and serene, these islands range from tiny to fairly large, and are only accessible via boats and ferries. My favorite dive charters in the area are Deep Sea Charters, Naknak Charters and Lu-Jac’s Quest. Visibility and current conditions are extremely variable in this part of Puget Sound, so dive sites are typically selected by the boat captain on the day of your adventure. This region generally offers more pristine marine habitat than further down South near the metro areas. For those willing to travel further North, some areas of British Columbia offer unparalleled diving conditions when it comes to visibility (100’+) and pristine aquatic habitats. However, nothing is without a cost and the logistics of getting to the best dive sites can be more difficult as these areas tend to be the most remote. Diving in British Columbia can be divided into two general regions, Vancouver Island and the Coastal Mainland (which includes the Vancouver metro area). Vancouver Island – There are many great dive sites within close proximity to Victoria, BC – which is a charming city to visit. The huge Victoria breakwater is a famous dive site – the quantity and variety of marine life increases the further you go along the breakwater from shore. Dive charters can take divers out to the artificial reefs created from the sunken ships HMCS Mackenzie and GB Church, or even out to the famous Race Rocks, a beautiful site facing the Strait of Juan de Fuca.Heading North of Victoria divers can choose to drive West to Barkley Sound for a wilderness experience matched up with a wreck dive on the sunken freighter, Vanlene. The central and North sides of Vancouver Island offer what is generally considered to be the best quality diving in the Pacific Northwest, and are the most difficult areas to get to. Many divers head to the artificial reefs/wrecks of the Saskatchewan and Cape Breton off of Nanaimo, BC, where they can see the vast amounts of life that have grown on these intentionally sunken ships.Those wanting even more of a wilderness dive experience can travel to beautiful Nootka Sound on the West side of the island or legendary Browning Pass to the North. At Nootka Sound you will find deep-water Gorgonian corals, Cloud sponges and walls covered in strawberry anemones, as well as bears wandering the streets topside (it really is that remote) – contact Tahtsa Dive Charters in Tahsis. At Browning Pass, located near Port Hardy, you’ll find huge majestic walls covered with soft corals, sponges and amazingly intricate Basket stars. Across the Queen Charlotte Strait from Browning Pass is a dive site known as the Nakwakto Rapids – a location where several major watersheds drain through a small passage, causing the tidal currents to flow past 16 knots and bringing heavily oxygenated water and nutrients to a vast assemblage of invertebrate life found nowhere else on Earth. If that doesn’t get you excited, I don’t know what will. Contact Browning Pass HideAway for diving in this area. Whytecliff Park – A popular site oftentimes used for classes, where Harbor Seals can frequently be seen.Porteau Cove – An easy entry makes this a popular site for classes when the wind is not too strong. The long surface swim takes you to Nakaya, a small wreck that sits around 30fsw. Lots of giant plumose anemones and lingcod can be found at this dive site. Whiskey Cove – Divers should be aware of boat traffic at this site, which is good for small critters such as the Red Irish Lord, various species of crabs and Nudibranchs. Bowyer Island – Divers may catch sightings of Wolf Eels and Octos here, as well as Sculpins, Sponges, King Crab and more. Mermaid Cove – An underwater mermaid statue, a lot of Anemones, Sponges and a diversity of fish. Octopus City – This site generally has pretty clear waters and lots of Moon Snails. Tuwanek beach – This site has an easy entry and Wolf Eels are commonly seen. As you can see, there is plentiful reason to don a drysuit (or brave a wet suit) in the emerald waters of the Pacific Northwest – Giant Octopodes, Wolf Eels, epic shipwrecks, screaming drift dives, seas brimming with beautiful invertebrate species, and a hearty dive community with members ranging from beginner-enthusiasts to serious technical divers – beckon the traveling diver to a pristine wilderness both above and below the surface waters. John Rawlings and Guanjin Mi contributed to this article. Northwest Dive Club – the most active dive club in the Pacific Northwest. Here you will find dive site listings, instructors & dive shops, boat charters, photography tips, trip reports and the friendliest, most helpful divers in the area. CalvinTang.com – Articles and underwater photography by the author of this guide to diving in the Pacific Northwest. John Rawlings – Photographer and Writer for Advanced Diver Magazine. Vancouver Diving – A great resource for the diver looking to visit the Vancouver or Sunshine Coast area in British Columbia. Seattle Area Tides & Currents – plan your dive and dive your plan! This article was originally written by Calvin Tang for Underwater Photography Guide. This entry was posted in SCUBA Diving, Underwater Photography, Water, Wreck Diving and tagged british columbia, canada, cold water, pacific northwest, scuba diving, united states. Bookmark the permalink. Both comments and trackbacks are currently closed. Footage filmed during an exploration of the hydrothermal vents in the sea floor of the Cayman Trough shows new species of shrimp swarming around the world’s deepest ‘black smoker’ vents and anemones lining cracks seeping warm water at one of the vent fields.